Friday was my first day at my new organisation and what an amazing day it turned out to be. Firstly I discovered that my house is less than ten minutes walk from my office so compared to my London commute, this year is already going to be paradise. When I arrived I was led around the office to be greeted in the most warm and genuine manner by everyone. Next I was brought into my beautiful bright office which had been cleared out and given a lick of paint. The place looked great! After some initial meetings with some of the management team, Julie and I were told that a special lunch time treat awaited us. 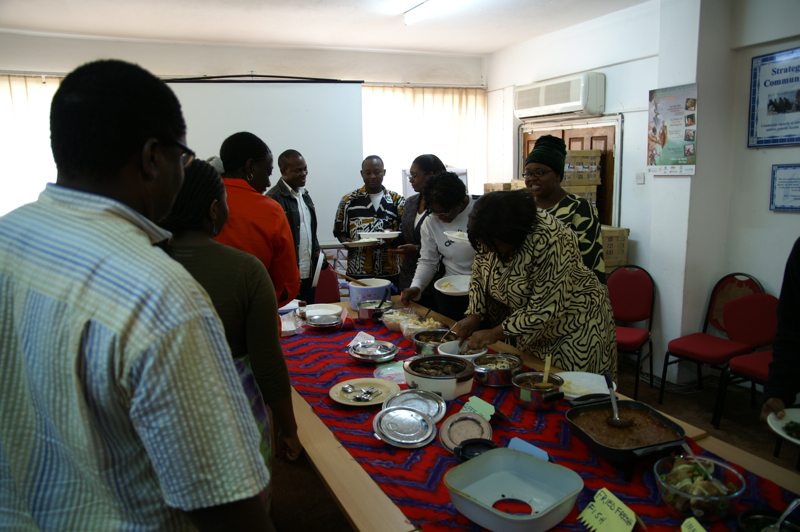 We made our way down to the main meeting room to be greeted to Matebeto: A whole room full of Zambian food. The tradition in Zambian culture is that some time before a man and wife become formally married, the man is invited to the woman’s family home and presented with all the dishes that her family are capable of preparing – a foretaste of the food he can expect during the marriage. 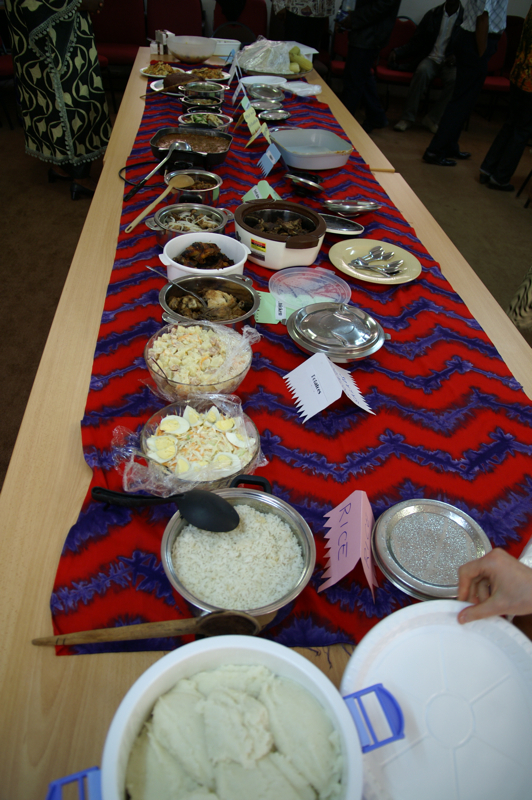 The office had adapted the ceremony and used the opportunity of a number of us joining the organisation to lay on a whole feast of Zambian foods – everyone bringing in something from their home! 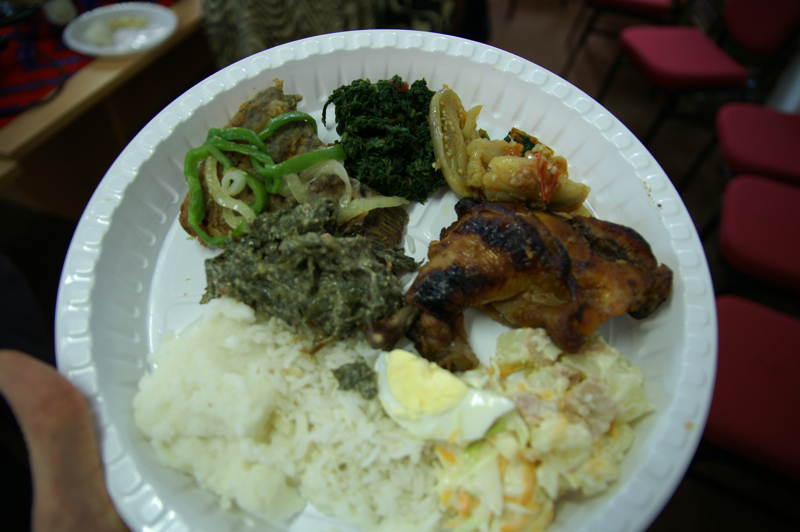 After a blessing and a brief introduction it was down to the feasting – chicken, beef steak, salads, maize, vegtables, pizza (!) and of course the ubiquitous nshima (mealy-meal) were all neatly laid out and effortlessly devoured over some very high spirits (it being the start of a long weekend). After the food, we made our way rather sleepily upstairs to make some formal introductions and outline our goals for the year. What a wonderfully warm and authentic welcome – I have a very good feeling about the year to come!